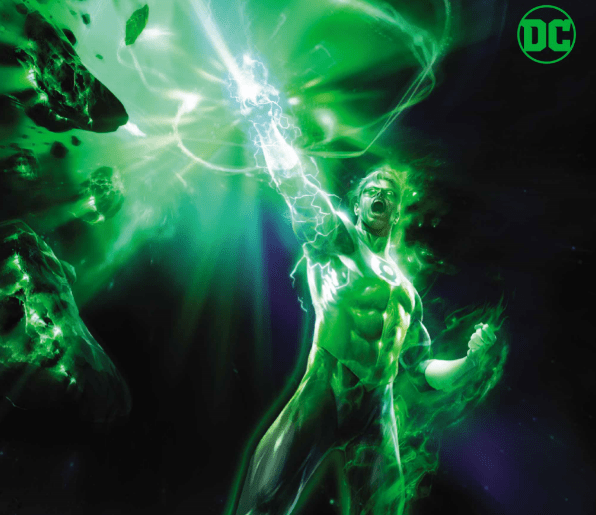 The Green Lantern #2 review – AiPT! Outer space is really weird. Who knew? After a marvelous debut, the dynamic duo of weirdness, Liam Sharp and Grant Morrison, look to maintain the high bar of bizarre in issue #2 of The Green Lantern. Let’s see if they can’t deliver another issue of astonishingly strange space cops. Our story picks up within the fathomless Obsidian Deeps of the Southern Supervoid, a lightless area of space far removed from the stars and celestial objects of the galaxy, in an abyssal expanse akin to the Mariana Trench. As with the deepest point on Earth, life here is blind and relies on sound to survive. Enter Green Lantern Rot Lop Fan — proud member of the F-Sharp Bell Corps; this silicon-based Lantern has no eyes and is completely blind, but has superb hearing and emits sound waves from his Power Ring which is shaped like a bell. Rot Lop Fan is a hero out of the Silver Age, and if you’ve already read the first issue you won’t find that particularly surprising, or the fact that he’s the jailer for a villain first introduced in 1965, Evil Star. Unfortunately for Fan, his prisoner escapes into the hands of the Blackstars, the henchmen of the nefarious Controller Mu. Yes I agree, it’s entirely possible that Morrison has a thing for the old days. Meanwhile as Hal Jordan is on his way to interrogate the captured arachnid space pirate, he encounters Volk, a Green Lantern with a volcano for a head. Volk debuted in 1985, was created by Todd Klein and Kevin O’Neill, and is another character out of the Silver Age. It’s almost as if there’s a pattern here. But seriously, a Green Lantern with a volcano for a head, how cool is that? Before I get ahead of myself in the story department, I have to talk about Liam Sharp. Between Rot Lop Fan’s jailbreak and Hal Jordan’s interrogation, we’re gifted with what is quite possibly the best drawing of Oa that I’ve ever seen. The image fills an entire page top to bottom and every centimeter is utilized to bring the city-planet of Oa to life in a way that’s never been seen before. The level of detail is astonishing and it pumps a shot of pure science fiction into your eyeballs — delivering a high every sci-fi fan yearns for. When Grant Morrison said he wanted to take Hal Jordan and the Green Lanterns back to their space cop roots, he meant it. Lantern Trilla-Tru and Hal Jordan interrogating the space pirate had a very Elliot Stabler/Olivia Benson feel to it. We had our good cop/bad cop routine, yelling, promises of rewards, and of course, Hal giving the pirate his best Elliot Stabler “I’m more messed up than you are” speech. I’m into it. We all know Grant Morrison is a complete weirdo, which thankfully is exactly what you want in a comic book writer. There have been occasions where those strong weird tendencies of his get let off the leash and end up running amok in an erratic, disorganized fashion that makes a complete mess of things. Though more often than not, his quirky and particular sense of humor has the perfect mix of funky and weird, which creates a unique and fantastic story — his Doom Patrol run being the best example of this. If The Green Lantern keeps moving ahead with the blend of weird Morrison has concocted, there’s a good chance it will one day be counted among his best weird-laced works. Maybe I'm imagining things, but did Liam Sharp turn a Dhorian into C. Montgomery Burns? Cause if he did, that's awesome! Volk is a Green Lantern with a volcano for a head. That is all. Two Silver Age Green Lanterns and a villain out of the 60s. I'm loving all these callbacks. Liam Sharp's artwork is great throughout, but his drawing of Oa is just incredible. This issue moves FAST. So while there was a lot coming at you quick, I never felt overwhelmed. There's just a lot to enjoy here.